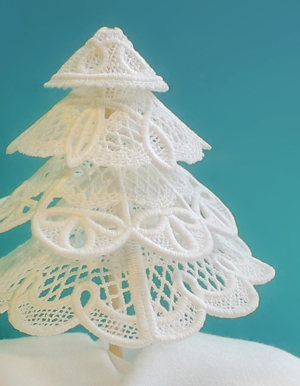 Liven up your holiday displays with this lovely and light lace tree! 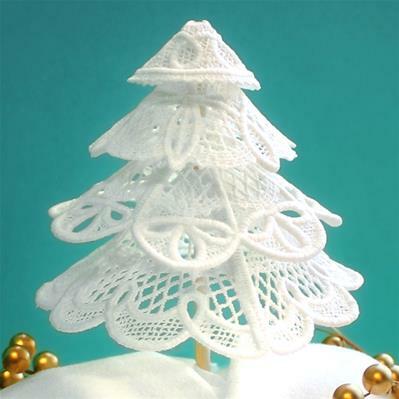 Put together from multiple freestanding lace pieces, this tree is easy to construct with a dowel, a few stitches, and hot glue. 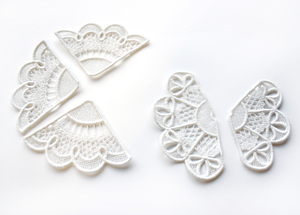 If you need a quick reminder on how to stitch freestanding lace, click here. Two of your tree layers need to be assembled together before we stack all of the layers together. The large bottom layer will be made of three identical pieces. The second tree layer comes in two pieces, one slightly smaller than the other, as shown. You can start with either piece. I started with the two piece layer. 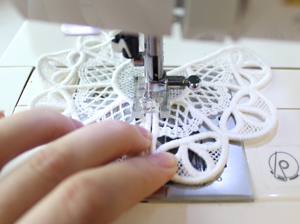 You can either hand-stitch the pieces together, or use your machine's zigzag stitch to secure them in place. This is what your second layer piece looks like with the parts stitched together. You can leave the last side open for now. Stitch the other multi-piece layer together. 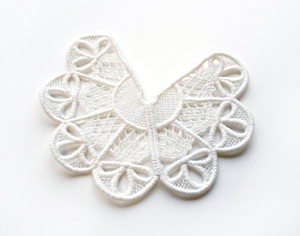 This one is the section with three lace pieces. 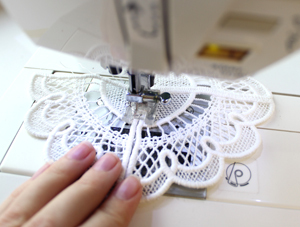 Once again, you can either hand stitch them or use your machine. 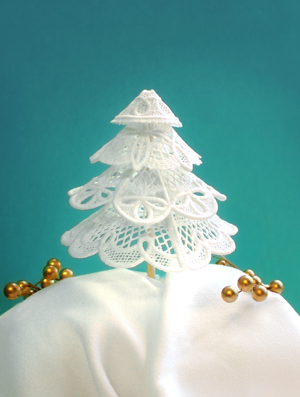 With your bottom two layers now assembled, you should have the four lace layers needed to make your tree, from large to small. Now we just need to shape each layer into a small cone shape. 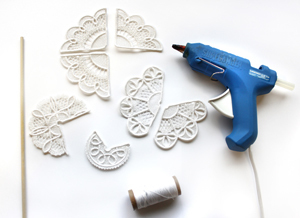 The easiest way to do this is with your hot glue. 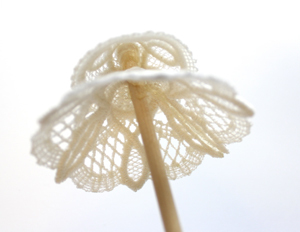 Run a small line of glue along one open edge of your lace and pull the other side around, touching them together. Hold them in place until your glue has dried. This is the curved shape each of your layers should be like when you're done. Continue closing up all your tree layers by gluing the open edge to the other side to make small cone shapes. This is what each tree layer should look like once everything is glued in place. Now we're ready to assemble the final tree on our wooden stick! 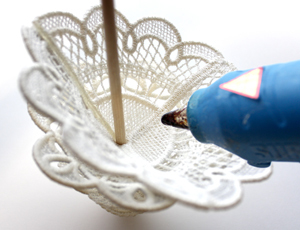 Each layer should have a small hole in the middle of the cone for you to slip a stick or straw through. Slip the largest layer over the stick first. 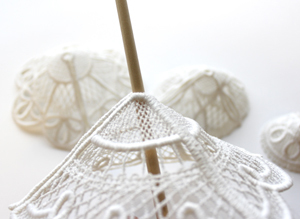 Continue adding the other sizes, from largest to smallest, until your four layers are on your stick. With all layers on, move your small top piece to the very top of your stick. 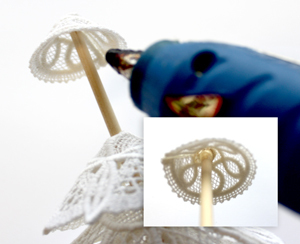 Add a large dot of glue to the underside of your lace, securing the top piece in place. Slide your next layer up under the top piece. 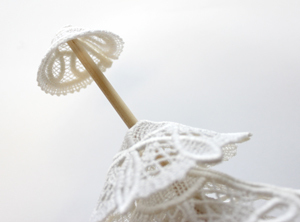 You'll want to slide it up high enough to the top cone of the lace is a little bit hidden under the piece above it. Glue the next layer in place the same way as you did with the top. Continue sliding up each layer and gluing them in place underneath, until you finish with the fourth and final layer. You're done! Now you can snip the stick to your desired height and use it in your holiday decorating however you like. 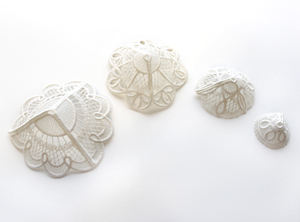 Delicate and lacy, it's the perfect accent to the beauty of winter and the glamour of the season. 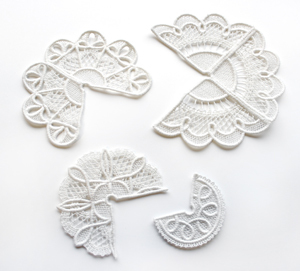 Plus, it's easily made with just a 4"x4" hoop! To display your tree, you can stick it in a floral/craft foam and then cover that in white fabric or fluff to make it look like a winter wonderland scene. Or you can add a loop to the top and hang it as an ornament. 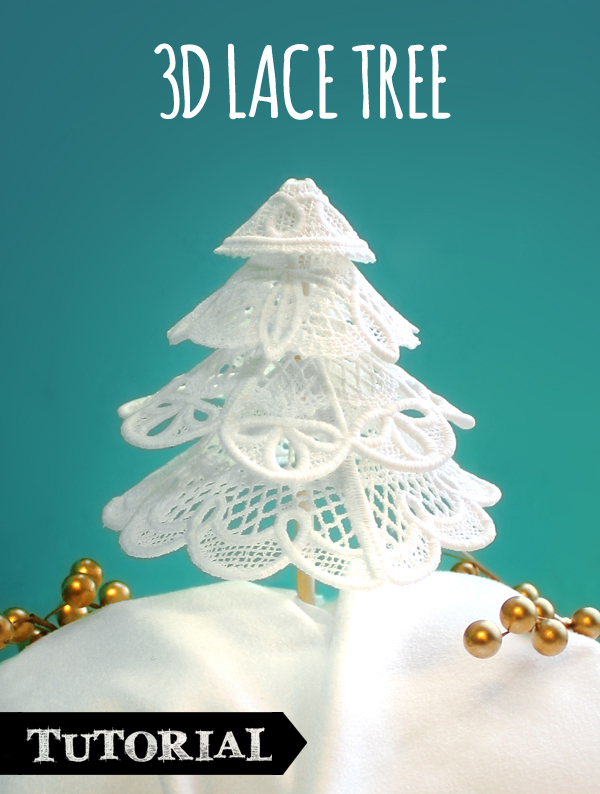 Make a mini forest of beautiful lace trees to brighten up your home for the winter season, all handmade by you!